"The oil markets are already flooded. It's like you've already had 16 inches of rain in a flood zone, and now you're getting a few more inches," said Tom Kloza, global head of energy analysis at the Oil Price Information Service. Because of the availablility of Iranian oil, Kloza thinks oil prices could dive to $25 a barrel for at least some time. If Wall Street remains reluctant to step in, he said historical trends suggest oil prices could even plunge to $10 a barrel. "For the rest of this quarter it's hard to see anything that fortifies oil other than some really big money saying, 'Okay, that's it,'" said Kloza. That should bring smiles to American drivers. The national average price of a gallon of gasoline dropped to $1.89 on Monday, down from $2 a month ago, according to AAA. Related: Will Iran get McDonald's now? How much oil is Iran hoarding? Much mystery remains over exactly how much oil Iran is hoarding at sea. While some estimate Iran has about 30 million barrels of oil on tankers, maritime data and analytics company Windward believes that figure is too low. Designed for intelligence services, Windward uses Big Data to track oil held on all ships in the Persian Gulf -- including those that do not transmit their location. 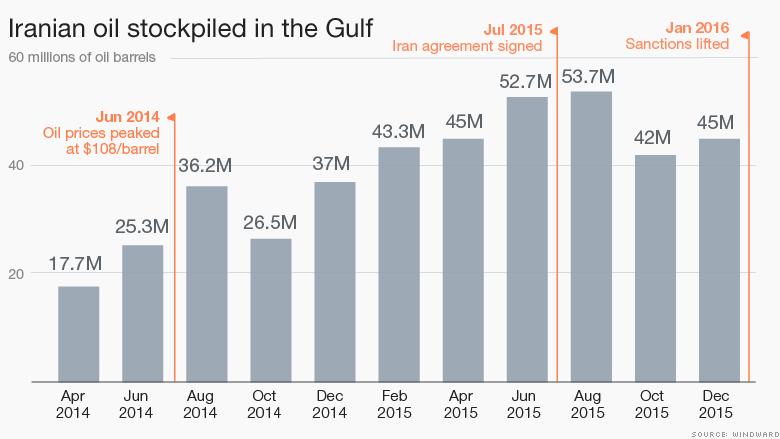 The firm estimates Iran is hoarding 46 million barrels of oil, nearly triple what it was holding since April 2014. So far, no oil tankers have left Iran since the sanctions have been removed, according to Windward. "When this oil leaves, where it's heading and at what pace are three key questions that will help solve the global oil puzzle," Windward CEO Ami Daniel told CNNMoney. Windward estimates that 18 million barrels of oil left Iran's floating storage since the nuclear deal was reached in July. Some of that oil went to China and South Korea. Windward said Iran replaced that oil with new production, leaving its floating storage down by a net 8.2 million barrels. It's not known exactly how much of this oil Iran will attempt to immediately sell. But it is clear Iran badly needs the cash as it looks to repair its sanctions-ravaged economy. "Every single barrel they sell to the market is revenue they weren't going to get last week," said Matthew Smith, director of commodity research at ClipperData, which tracks global oil shipments. But that equation may change if oil prices crumble much lower. "There will not be much demand for this oil," Capital Economics wrote in a research report. "We do not believe that Iran would want to depress prices much further by rushing to dump its inventories." Kloza said he expects Iran will try sell the oil to customers in Europe as well as Asia, a key market for Iran's archenemy Saudi Arabia. "It doesn't really matter where it goes. 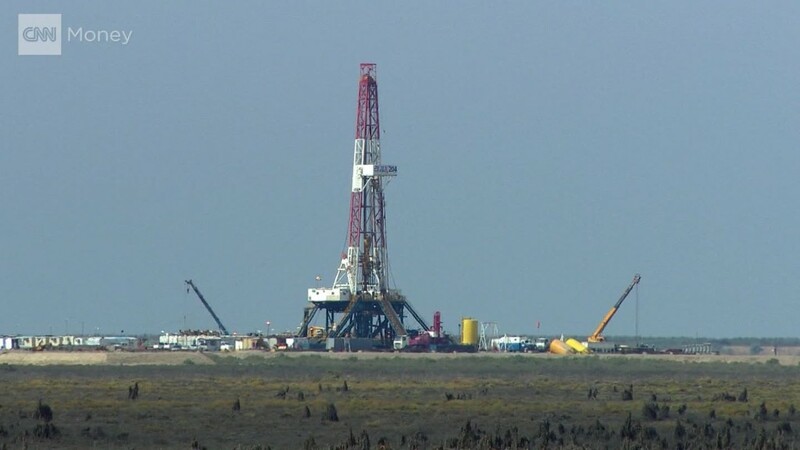 It just accentuates what is a pretty ugly supply situation," said Kloza.